Pirates Of Archery • View topic - Montana! I have owned two of the Bear Montana longbows over the years, and didn't really get along with them too well. 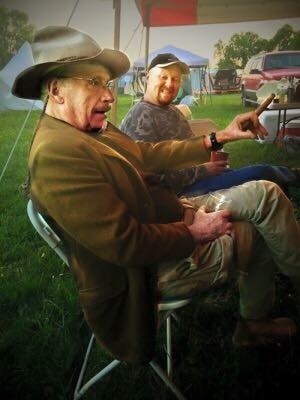 After the fact and after shooting Howard Hill bows for awhile, I realized there was nothing wrong with the Montanas, except the person holding it. I have not tried one since I have been shooting longbows for the last several years but one of my sons shoots one as his go to bow and has killed a lot of critters with it. I recently got one in for our raffle bow for the upcoming S.T.A.R. shoot. I specified that I wanted one of the new brown Dymondwood ones with the brown glass. I got it in the other day and have to say.... this is a very impressive looking bow. They have changed a lot on the bow since I had my last one 8-10 years ago. The limbs seem to be thinner and instead of the huge blocky limb tips, they have more dainty tips. The white limb tips really look nice against that brown glass. The limbs have a slight reflex/deflex in the design. The Brown riser has a few birthmarks in it and this bow makes a great looking package. I haven't shot it yet as it is still sealed in the plastic so the raffle winner can have a virgin bow to play with. But... I do plan on being that raffle winner. 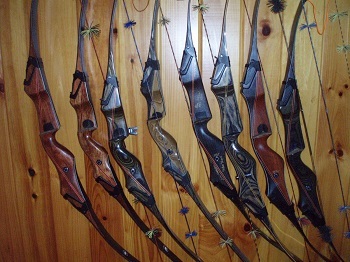 When I was down at the Bear factory last year, I was told that the Montana is their best selling bow by far. Understandable... looks to be a heck of a bow for the money. Ahhhh no........I'M gonna be the winner on this one!!!! Both of you are wrong! I'm winning so the Bear recurve I WON has a longbow to go with it!